South Carolina Congressman Trey Gowdy has been chosen as the next chairman of the House Oversight Committee, beating out Oklahoma's Steve Russell for the job. Gowdy will replace outgoing Chairman Jason Chaffetz of Utah, who announced his retirement from Congress last month. Chaffetz' last day is June 30. 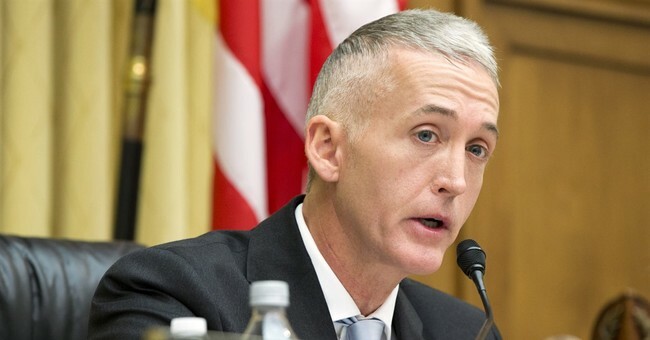 "Trey Gowdy is the right person for the job. He has a long history of demanding accountability, upholding transparency, and relentlessly pursuing the truth. Under his capable leadership, the Committee will continue to work towards ensuring effectiveness and efficiency throughout the federal government. As his friend and colleague, I have every confidence in his abilities moving forward," Chaffetz released in a statement. “The steering committee was fortunate to have two good options. I congratulate Steve Russell for throwing his hat in the ring. He has loyally served this country first in the U.S. Army, and now in his current capacity representing the people of Oklahoma. I have high expectations of the contributions he can make going forward." “It has been the privilege of a lifetime to serve as Chairman of this historic Committee. I look forward to working with Chairman-elect Gowdy to ensure a smooth transition of the gavel,” he continued. Gowdy is a former federal prosecutor and current member of the Committee. In 2014 he was tapped to lead the House Select Committee on Benghazi. He also serves on the House Intelligence Committee, which has been investigating Russia's meddling in the 2016 presidential election. The House Republican Conference will vote on his nomination Tuesday, when his position will be made official.